Get behind the wheel of the most sought-after cars in the world. Discover the true meaning of automotive performance as you race around a professionally designed Exotic Car Autocross course in a Lamborghini Gallardo, Ferrari, Audi R8 Couple, McLaren MP4-12C or Masserati GranTurismo. These beautifully constructed machines from Europe's leading supercar manufacturers will astound you with their power, speed, handling and style. An autocross is a timed competition where drivers navigate supercars one at a time through a pre-defined course. Autocross differs from road racing and oval track racing as there is only one car on the track, racing against the clock rather than against other cars. The combination of concentration, skill, reaction, and the supercar’s capabilities are a formula for an adrenaline pumping experience. Autocross courses are designed to showcase the handling and performance of these elite supercars. The course is approximately one kilometer long featuring tight twists, turns, and straights, placing demands on car handling and driver skill rather than on speed and engine power. There will be an exotic car driving expert in the passenger seat for guidance and safety, but you will have complete control of the vehicle. This experience is a great way to experience every aspect of an elite exotic car's speed, handling prowess and braking ability. 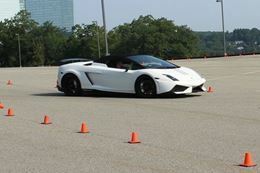 Drive a Supercar on a professional autocross track. All the vehicles have an automatic transmission. This allows for more accurate, faster acceleration through corners and sprints. You will make your selection for the exotic car that you will drive when you reserve your experience time/day with the driving experience provider. The course is an autocross style course that is set up with cones and is geared for agility driving. You must be a minimum of 5 ft tall. Family and friends are more than welcome to watch you drive. Access to see the course is limited due to safety regulations. Please note that this experience is dependent on weather. In the event your date is cancelled due to weather, your certificate will be honored for a future date. No refunds can be issued. Make a supercar fan's day with this amazing driving experience. A truly unique gift!